Welcome to the Week 15 edition of the 2018 fantasy football trade value chart, which helps you analyze potential trades to improve your fantasy football team. Our chart assigns a value to all relevant players — across all positions — to help you make the best trade possible. The trade value chart uses our rest-of-season projections to assign values to every relevant player. The dollar amounts assume a 12-team league and a starting lineup of 1 QB, 2 RB, 2 WR, 1 TE, and 1 flex. The players are displayed in order of their standard league values, but we’ve included the PPR values for those players as well. Most traditional season-long leagues have closed their trade windows, but keeper and dynasty leagues may still have open doors — so this piece will focus on names from that perspective. With that in mind, Spencer Ware is a noteworthy player. His rest-of-2018 value increased the second-most this week (+$17.3 in standard leagues), and he’s set for free agency as a 27-year-old with minimal wear and tear. The Chiefs could retain him (which would be great for his fantasy value), or he could find a new home. Either way, he’s a very interesting trade target at the moment. 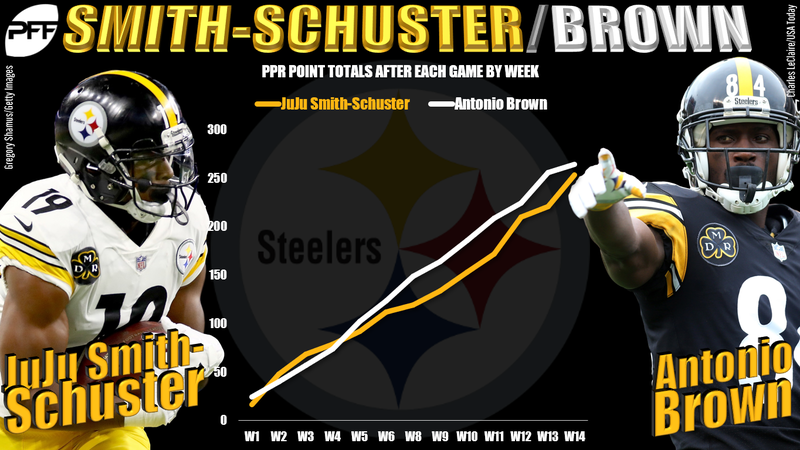 JuJu Smith-Schuster also saw his value rise this week, and it’s worth asking if he’s the Steelers wideout to own in dynasty and keeper leagues moving forward. He only just turned 22 (less than a month ago), and he’s built upon his impressive rookie campaign with a truly breakout sophomore season. He has 91 receptions, 1,234 yards and six scores with three games still to play. He has more receptions and nearly 200 more receiving yards compared to Antonio Brown, and he’s 8.5 years younger. Check out the full chart below. Remember, these values are not written in stone. Rather, they are meant to serve as a guide to help you make the best deal possible.